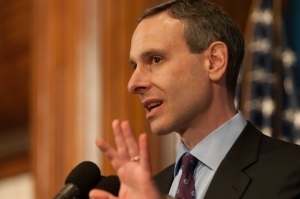 IRS Commissioner Douglas Shulman says Congress must act quickly to address expiring tax cuts. Shulman spoke at a National Press Club luncheon April 5. Beyond a sharp tax hike, Shulman warned that Congressional inaction could also wreak havoc on Internal Revenue Service operations, describing a scenario in which the public, acting in “total confusion,” inadvertently files under two different tax codes. The commissioner also addressed ongoing projects on the agency’s agenda, including a far-reaching plan to ensure that professional tax preparers are regulated. With the April 15th filing deadline fast approaching, Press Club President Theresa Werner had some personal tax-day questions for the commissioner: Has he ever been audited and does he file his own taxes? “When you become IRS commissioner, every tax lawyer in the government takes a look at your returns, so my returns have been thoroughly vetted,” Shulman explained. As for the second question, Shulman acknowledged that he relies on a little outside help. “I actually have a preparer prepare my tax returns,” Shulman said.